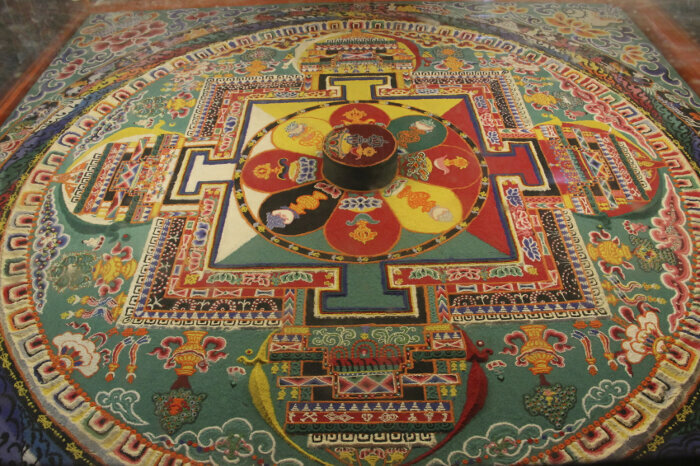 Mandalas occur in many Buddhist traditions, but they are most common in Tibetan communities, where they can be enormous, sometimes several feet across, draped over an embroidered cloth and hung against the wall in a temple, a restaurant, or a home. Mandala is a Sanskrit word meaning “circle,” and, at the most basic level of appearance, that’s what a mandala is, a beautifully inscribed circle adorned with geometric patterns and Buddhist figures or scenes. Apart from their aesthetic value, mandalas also have a significant ritual and symbolic meaning in the Tibetan Buddhist tradition. In Buddhism, all beings are capable of attaining enlightenment, or “Buddhahood.” In this way, most Buddhists believe that the Buddha was not a divine being in the same way that Jesus Christ is usually thought to be the physical incarnation of God. Rather, the Buddha was an ordinary man who achieved a special transcendent state called “nirvana,” or enlightenment. It is crucially important in studying Buddhist thought to understand that we are all capable of achieving enlightenment in the same manner as the man we call the Buddha. In fact, in the history of the multiverse, there have been many Buddhas. Countless Buddhas. Countless Buddhas in countless worlds in countless realms. Achieving enlightenment, each Buddha generates a special influence on the world he is in. Some Buddhas are known for establishing separate realms, pure and sacred spaces called “Buddha Fields.” One interpretation of mandalas is that they represent these Buddha Fields. 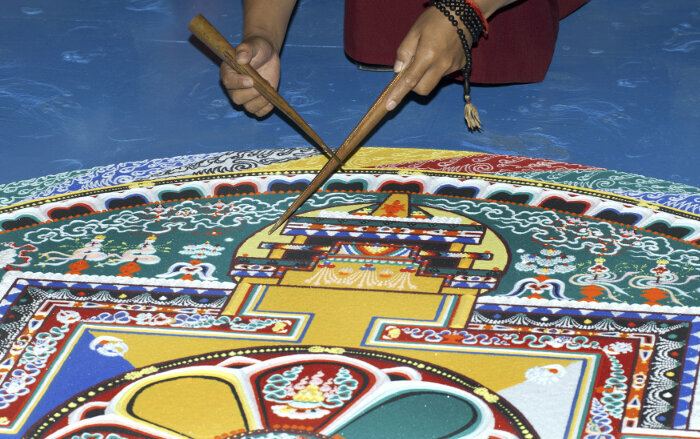 In the Tibetan tradition, proper mandalas are usually made of sand or painted on heavy paper. They are common souvenirs for foreigners traveling in Tibet, Nepal, Northern India, and other areas with large Tibetan Buddhist populations. They are captivating pieces of art, and you may have encountered one at a friend’s home or a Himalayan restaurant. The ornate gold and amber hues of thangka paintings often form decorative mandalas. For most Tibetans, these are entirely appropriate ways to view a mandala, and there is no sacrilege in placing such sacred art in secular spaces. In Tibetan tantric initiation rituals, a spiritual teacher, called a lama or guru, designs a mandala in a sanctified space. The mandala represents a perfect world that the initiates will enter, and is kept hidden from them until the appropriate time. The lama acts the role of the Buddha of the world represented by this mandala and the initiates are to venerate him accordingly. The specific actions that follow vary from place to place and depend on the circumstance, but the goal of the initiate is to “enter the mandala” and become the Buddha of that world himself. As a meditative aid, monks will sometimes invest great effort in absorbing the image of the mandala. The work is to learn the intricacies of the mandala such that a monk can recall them from memory. Practically, the immense concentration involved in this process calms the mind. Spiritually, the mandala represents a pure and sacred realm that the monk may invoke or enter through prolonged meditation. In a special ritual, Tibetan monks make an immense sand mandala from colored grains of sand layered onto a flat surface. A group of monks affiliated with Emory University is known for travelling around the continental united states to perform this ritual on college campuses and in other institutional spaces. Once completed, the mandala is ritually disassembled in a precise order. Sometimes half of the sand from the mandala will be given away to spectators. The rest must be poured into a nearby body of running water, carrying the peace-invoking energy of the ritual along its course and, eventually, to the open ocean and the whole world. Finally, mandalas are commonly painted and sold by the Tibetan diaspora community to people like you and I. This work helps to financially support Tibetan exile communities and it also spreads awareness of Buddhism and Buddhist ideas. Devout Buddhists take as their model ideal the “Bodhisattva way.” Bodhisattvas are beings who, like Buddhas, have attained enlightenment. Unlike Buddhas, Bodhisattvas choose to remain in the realm where they were born, neither passing into an alternate pure land, nor fading into enlightened bliss. When we spread knowledge of the Dharma, the Buddhist teachings, we are said to be “turning the wheel” of Dharma. Mandalas, hold the eye and capture the heart of the viewer, turning the wheel and inviting us all to enter these unique and sacred spaces. If you’d like to know more, consider readingThe Story of Buddhism: A Concise Guide to its History & Teachings, by Donald S. Lopez Jr. Professor Lopez is a scholar of Buddhism who writes with clarity and passion, specializing in the Tibetan tradition.